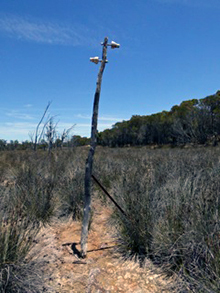 These wooden telegraph poles are in the Murchison along a disused portion of a main road. Due to the style of construction it is likley this line was part of a private line to connect two pastoral stations, or a station with an outstation rather than a PMG line. 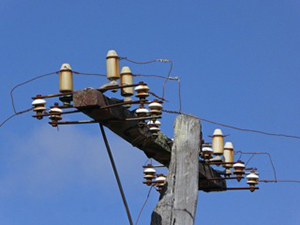 The insulators are unbranded and quite small, being about 5cm high and 4cm in diameter. These insulators are referred to as reel or button insulaters. Iron wire was used for this line. 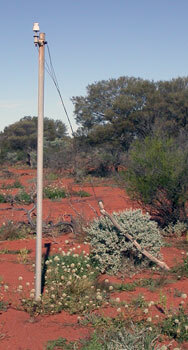 A metal telegraph pole on a private line which used to run between two homesteads. 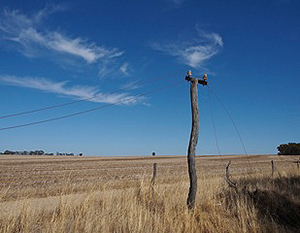 The line used to be connected into the PMG network. 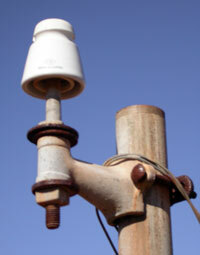 The insulator on the pole is 6cm high and 5.5cm in diameter at the base, branded FK and made in Japan. A broken insulator was found on the ground nearby. This insulator was larger, being 12cm in height and 7.5cm in diameter at the base and unlike the other insulators has a protruding "inner shed". It was embossed "Bullers Ltd London." 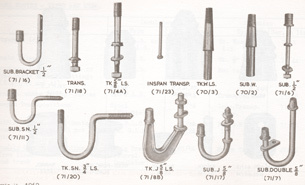 The Teleramics website has information on Bullers Ltd and British insulators. 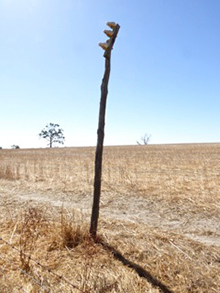 The bracket could be an Overland Telegraph line insulator side bracket. 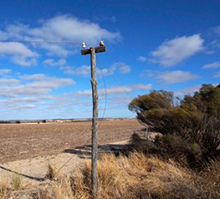 Sometimes stations or farms used one of the wires in a fence as a communications line. 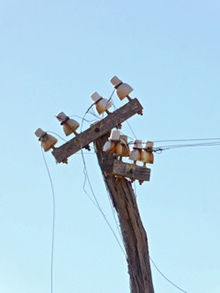 Insulators from old telegraph lines have on occasions been recycled and used in electric fences. In 1950 the PMG published a booklet for farmers and pastoralists with the title of How to Construct & Maintain your Telephone Line. View a digital copy on the National Archives of Australia website. Note: The Postmaster-General's Department (PMG) was established as a result of the federation of Australian states and territories. It ceased to exist in December 1975. It was responsible for postal, telegraph and telephone services. Thanks to Leonard Jannesse for suggesting improvements to this page and supplying photographs. Any comments, corrections or additional information welcome! Please email John using the feedack button below.